Judy Blume will be speaking at the University of Hartford on June 21st as a fundraiser for The Mark Twain House & Museum. I’ll be interviewing her onstage and taking tons of audience questions. In preparation, I will be reading her complete works and blogging about the experience. Get your tickets here. I am an oldest sibling. Always quiet and rather, in my opinion, reasonable, I was sometimes blindsided by the mischievous energy of my brother and sister. My brother would hide in racks of clothing in the department stores; my sister punched my father's secretary in the face for calling her "cute." 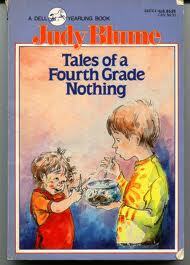 Judy Blume's Tales of a Fourth Grade Nothing is sincerely hilarious. Something about the deadpan delivery of poor old Peter Hatcher, eldest sibling just trying to live through another day in the company of the tyrannical Farley Drexel Hatcher (nickname: Fudge, age: four, occupation: casual anarchist). I read this book as a kid (of the seven I've tackled so far, I've read five-- an even better track record than I expected), and while the classic turtle-swallowing scene stands out for pure shock value and tragedy, there were some other exchanges that had me laughing out loud this week. "Yes, Dribble's a turtle. My turtle," I said in a soft voice. "They can all see," I told Fudge. I wondered why he wasn't afraid this time. "What does Dribble do?" Jennie asked. "He doesn't do anything special," I said. "He's a turtle. He does turtle things." What was with this kid, anyway? "Well," I said, "he swims around a little and he sleeps on his rock and he eats." "Does he make?" Jennie asked. "Make a tinkle?" "Oh, that. Well, sure. I guess so." Jennie laughed. So did Sam and Fudge. "I make tinkles too. Want to see?" Jennie asked. Having spent four or five summers as a camp counselor for kids age 3-5, I can assure you that this is exactly how things go wrong fast. You think you're having a normal conversation and WHAM: a kid is peeing in place. It happens more than you'd like to think. There are so many great moments in this book: the return of "eat it or wear it," originally used as a punishment, late in the novel; serious statements like "I will never forget Friday, May tenth. It's the most important day of my life," from poor Peter; tidbits snuck in there for older siblings like "I got the message. It was like buying the shoes and like at Dr. Brown's office. They were going to use me to get Fudge to do what they wanted him to do. I wondered how anybody would ever manage my brother without my help." It all seems carefully and realistically constructed-- which is why I was shocked to read on Judy's website that she did not revise it at all. I suspect these comic anecdotes, built up from her years as a mom to Randy and Larry, came pouring forth. There comes a time when you just have to laugh at (and with) your little kids. Otherwise, the insanity might get to you.